(25-12, 25-19, 26-24) on the road. The game against Churchill proved that we can dig deep when needed. After winning the first two sets fairly easily, Churchill put us against the ropes leading 24-19, and needing only one more point to take the 3rd set. Our team regrouped, behind junior Abby M.’s strong serves, winning the next seven points in a row to take the third set, and the match, 26-24. It was very rewarding to watch the team pull together, play hard, and focused for each point, and show their competitiveness when it was needed the most. This was a great testament to our ability to stay focused, determined, and intense, even under pressure. The BFS Girls JV Volleyball Team defeated Churchill 2-0 (25-17, 25-14) in the upper gym. The team met strong competition today in their match, but they still found away to come away with the victory. Churchill had several tough servers and skilled players at the net. BFS players covered the court with confidence and brought their team work to a new level! Anna F. served 5 aces and Silvely A. had 5 winning touches at the net. Blue Pride! The BFS MS Boys Soccer Team defeated Churchill 4-2 down at Brooklyn Bridge Park. Today the team came back from two goals down to beat their opponent in dramatic fashion. BFS started the brighter of the two teams, and started to create a few good opportunities. In particular, Gabe D. was looking very lively upfront and caused the Churchill defense some early problems. However, Churchill were quick on the counter attack, and they took the lead 5 minutes before halftime. BFS were slow to start in the second half, and it wasn’t long before they found themselves 2-0 down. However, this provoked an immediate response from BFS, and on 40th minute they halved the Churchill lead. Gabe D. picked up a Miles B. pass to slot the ball inside the far post. 5 minutes later BFS drew level. The goalie failed to hold onto a Lewis W. shot, and the ball edged over the line to tie the score 2-2. Miles J-P rounded off a deadly 7 minute spell for BFS, giving them the lead for the first time in the game after some clever work from Lewis W. to find a pass in a congested penalty area. BFS defended with all their strength for the remainder of the game, with some powerful tackles from Ty S. and Sam F. to ease the pressure on the back line. Lewis W. completed the win for BFS with an outstanding freekick after Miles B. was fouled on the edge of the penalty area. He curled the ball over the Churchill wall and into the top corner, beyond the despairing reach of the goalie. BFS showed tremendous character to win in such a courageous manner. Churchill looked to be heading for a comfortable win, but BFS refused to give up, and in the end they were worthy winners. The BFS Boys Varsity Soccer Team defeated Churchill 8-1 down at Red Hook. The victory gives the team a 4-2 record for the season. The Panthers started the game off with great energy an focus. Junior Henry K. scored his and the teams first goal of the game. With an own goal being scored by Churchill and junior Noah Walker adding two more, this gave the Panthers a commanding 4-0 lead at halftime. The second half was no difference, with Noah W. completing his first career hat-trick and junior Quran D. adding a fourth goal to his seasons tally. There were also a couple of Panther first timers, with goals from both freshman Justin W. and sophomore Sam G. grabbing their first career goals. Honorable Mentions: Henry J., Lucas M., Omar M., Lateef F., and Sam H.
The BFS Girls Varsity Soccer Team defeated Churchill 7-5 down at Red Hook. Churchill came within one goal of making a superb comeback, only for Freshman Niamh H. to score a wonderful solo goal late in the game to secure a highly captivating 7-5 victory. BFS was missing eight players from the roster and the rest of the team was pushed to the limits in a competitive ISAL league match. Senior Louisa G’s participated in her 50th game for the girls varsity soccer team. Sophomore Halima M. scored a hat trick during the 1st half of the game and added a fourth goal in the second half. One of the goals being so impressive that Halima received a congratulatory handshake from the referee. Junior Naya C. rounded off the scoring with two goals. Devon O. picked up three assists. The team had a good performance with a highly quality brace of goals. 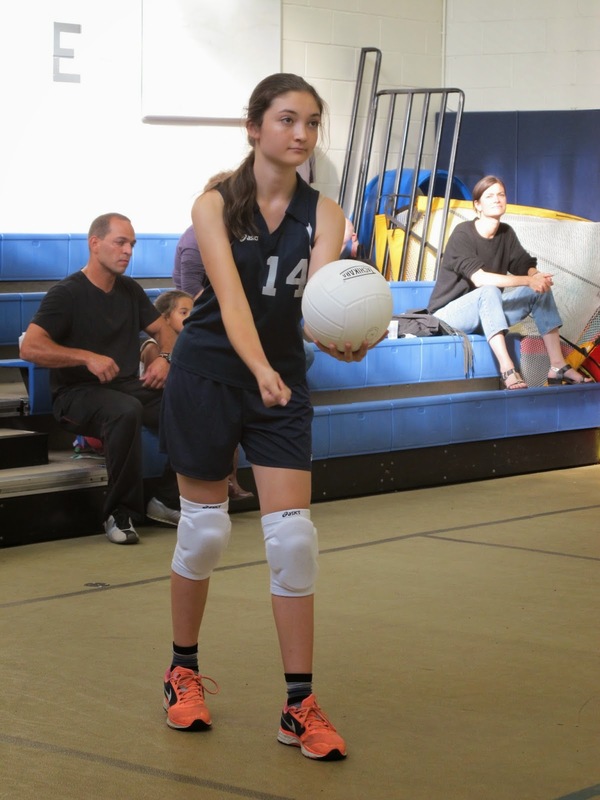 On Wednesday the BFS MS Girls Volleyball Team defeated York Prep 2-0 (25-22, 25-13) on the road. The team needed some time to adjust to the dimensions of the York Prep’s gym, but once they did the girls had some exciting highlights. After breaking York’s streak of seven serves, Galen J. helped BFS back into the game with four consecutive serves and Isabelle J. subbed in earning the team two more points by placing the ball close to the net where York could not play it back. Veronica M., Grace F., Milla S., and Maxine S. moved around the court passing the ball to the center of our own court to then be placed in open space. The girls worked well communicating and were very successful. Most exciting point according to the girl’s was Sage G.’s the winning point. The BFS Girls Varsity Volleyball Team defeated York Prep 3-0 (25-18, 25-15, 25-10) in the upper gym. Today we saw the results that come from focused practice. The team had one of their most consistent matches of the season. The team controlled the pace of the match from beginning to end, behind strong serves and smart plays throughout the match. The girls are really understanding how important it is to stay focused, determined, and consistent throughout the match. Overall, a great learning experience, and a very satisfying performance against a competitive team…Blue Pride!! 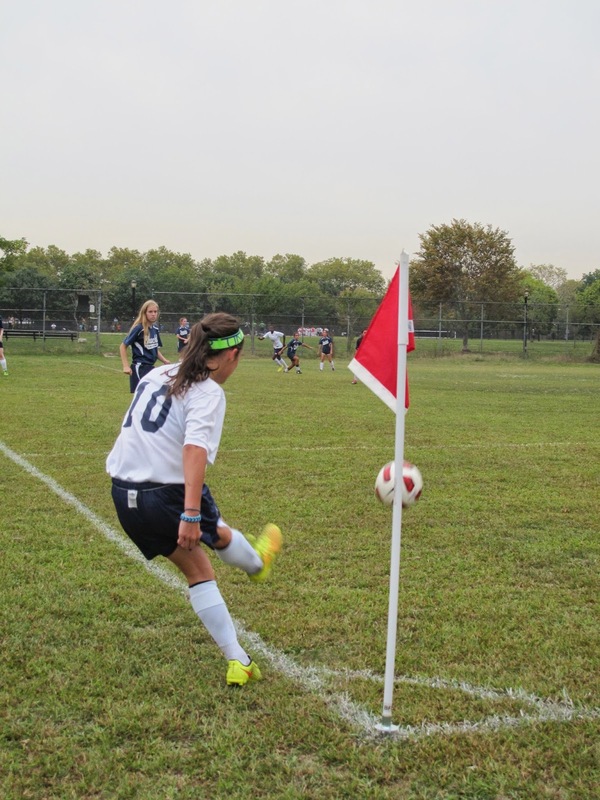 The BFS Girls Varsity Soccer Team defeated St. Ann’s 7-0 at Brooklyn Bridge Park. BFS secured a stunning 7-0 victory against Saint Ann’s at a rainy Brooklyn Bridge Park. The team raced ahead with three goals in the first 15 minutes to leave their opponents with little chance of getting back in the game. Devon O. hit for four goals, and Halima M. with a hat trick put the Panthers in seventh heaven and secured an excellent win. The BFS Boys Varsity Soccer Team defeated York Prep 2-0 down at Red Hook. The Panthers started the game with great energy and focus. The goals came very early into the game starting with a speedy run by junior Quran D., up the left flank, who ran past three defenders to then slide the ball past the keeper for his fifth goal of the season. The Panthers doubled their lead with a wonder strike by sophomore Charlie S. from about 30 yards out into the left corner for his first goal of the season. After conceding two quick goals, York Prep stepped up the intensity offensively. That intensity was matched by the Panthers defensive mentality. Led by a some key saves made by senior goalie Thomas C., who recorded his first clean sheet of the season. Honorable Mentions: Omar M., Henry J., Colin P., Ben F. and Sam F.
The BFS MS Boys Soccer Team defeated York Prep 5-2 down at Red Hook. Today the BFS middle school boys won their 5th straight game with a convincing victory. They started brightly, with some slick passing on display from the midfield as BFS lay siege to the York Prep goal. The BFS pressure was rewarded on 7 minutes. Thomas L-H beat the defender in the penalty area and laid on a pass for Shamshad A. who fired the ball into the roof of the net for his debut goal. Shamshad A. was on target again 3 minutes later with a neat finish after an incisive pass from Miles B. BFS were 3 goals to the good on 20 minutes. Thomas L-H was once again the provider, this time setting up Jack B. who finished exquisitely from the edge of the penalty area. York Prep raised their game in the second half, and BFS were forced to work hard to make the game safe. After conceding a goal shortly after the break, BFS struck back through Jack B. This time Shamshad A. provided the assist with a good cross from the right side. York Prep struck back within minutes, but Miles B. finished the scoring with a fine finish having stolen the ball from the opposing defender. Overall, it was another very good performance for BFS, who are averaging more than 5 goals a game so far this season. Blue Pride! On Thursday the BFS MS Girls Volleyball Team defeated Dalton 2-0 (25-22, 31-29) on the road. This has been the most exciting yet nerve recking games this team has played thus far. It was a well matched game, both teams had some great serves no thanks to a low ceiling. Eva H., Charlotte T., and Galen J. putting all her serves right down at the middle yet so close to the ceiling Dalton must have thought they were going to skim and did not go after her serve. Cameron G. had the most amazing serves yet, she kept that ball low at the net making it extremely difficult for Dalton to pass it back over. The ending the game could not have been written any better, every point BFS made Dalton countered and vise versa. Cameron G. played well at the night placing the serve and a pass close on the other side not allowing Dalton to put it back over, giving us a point and making it 30-29. She then went on to serve an ACE making the final score of 30-19 BFS! The BFS Girls JV Volleyball Team defeated Mary McDowell 2-0 (25-17, 25-16) in the upper gym. The victory came against our neighboring Quaker School, Mary McDowell Friends School. This was the teams most evenly played match of the season, with all our players showing greater consistency in both their serving and passing skills. The girls are always supportive of one another and they continue to improve playing together on the court as one unit. Blue Pride! The BFS Boys Varsity Soccer Team defeated Mary McDowell Lenox 8-0 down at Red Hook. The team had a great week picking up three victories along the way, including this one. The players continues to grow and learn on and off the field. Noah W., Omar M., and Quran D. all had two goals a piece. Both Lucas M. and Colin P. scored their first goals of the season. Goalie Thomas C. recorded his second clean-sheet in consecutive games. Honorable Mentions: Shomari M., Sam B., Henry J., Henry K., and Charlie H.
The BFS MS Boys Soccer Team tied Birch Wathen Lenox 0-0 down at Red Hook. Today the BFS middle school boys soccer team extended their unbeaten run to six games with a hard-fought 0-0 tie. BFS enjoyed a lot of possession in the first half, but they were unable to penetrate a well organized BWL defense. Miles B. and Jack B came closest for BFS as they looked to break the deadlock. Goalie Patrick D. was in fine form, and made a couple of outstanding saves to prevent BFS from falling behind. The second half was evenly balanced as both teams battled to get the decisive goal. Gabe D. came close to finding a winning goal, but ultimately BFS had to settle for a tie, which was a fair result on the balance of play. Blue Pride! The BFS MS Girls Soccer Team tied LFNY Lenox 1-1 down at Red Hook. BFS controlled the majority of the contest with great defensive pressure, and key saves made by eighth grade goalie Hannah S. The BFS pressure was rewarded with an exquisite kick from fellow eighth grader Sofia A., marking her first goal of the season. BFS would maintain great pressure and intensity throughout the second half but LFNY increased their offensive intensity and was able to score a goal late in the game. The game would conclude with a score 1-1. Overall, it was another very good performance for BFS. Blue Pride! The BFS Girls Varsity Soccer Team defeated York Prep 8-1 down at Red Hook. BFS scored 8 goals against York Prep in their last ISAL league game before the playoffs. Sophomore Halima M. added four goals to take her season total to 23 in 9 games. Devon.O also hit a hat trick, with junior Naya.C rounding off the score to make it 8-1. 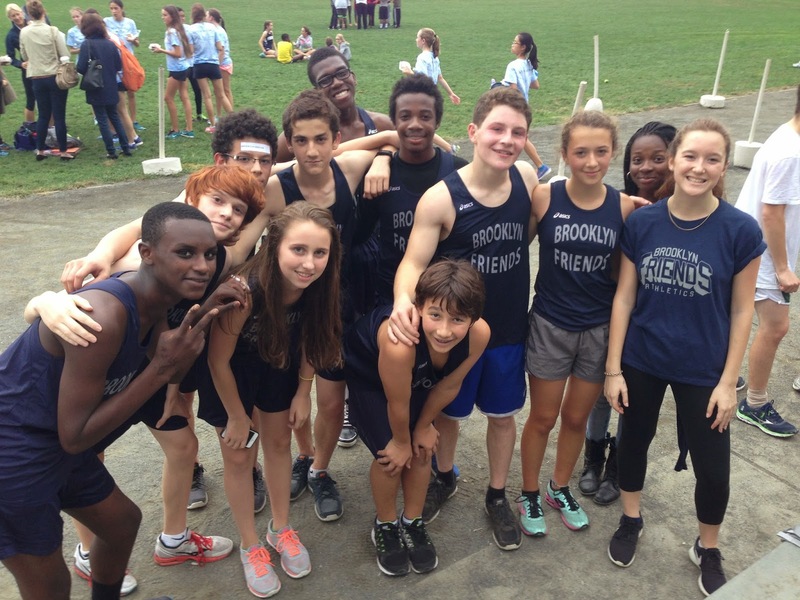 The BFS MS/US Boys & Girls Cross Country Team participated in an ISAL meet at Van Cortlandt Park. We had some veterans on the course, but for some, it was their first meet of the season, and for others it was their first time running in a cross country race! The trip up to the race was filled with excitement and curiosity at the same time. Once our team got settled and jogged as a group around parts of the course, confidence and composure filled their shoes. Helen L. and Sidney E. were the first to toe the line. For Helen L., it was her second year on the team and she ran the course with confidence, finishing 3rd in a time of 11:45. She stated that the course was easier than she remembered it to be. Most of her ease in running came with running on her own, like last weekend’s 5k charity run she had registered with her mom. Sidney E. powered through the course to the front of the pack with confidence, and soon learned of the hills Van Cortlandt Park is infamous for, but with Coach Jane and teammates Aishat A. and Maya B. midway through the park cheering him on, Sidney E. found a second wind and cruised to a great time of 12:50 for his first cross country race. The US Boys took the course next with Jacob leading the charge finishing in 20:23 for 3rd placed, followed by Miles N. swiftly behind in 20:51, literally sprinting so fast down the home stretch that not even with his shoe falling off, would it stop him from catching two runners in the last 200m. Our next 3 runners worked with each other on the course showing what real team cross country is, using energy off each other: Ernest finishing in 15th (22:09), Emmitt S. in 18th (22:30), and Nat E. in 22nd(23:29). Maalik D. and Juan C. worked together closing out the scoring for our Boys’ team sprinting it home cheered by their teammates in 31st and 32nd place out of 55 runners running 25:05 and 25:17. The boys were very excited about having a full scoring team and a larger number of runners on the squad! Giovanna M. toed the line a few minutes after the Boys kicked off the race. She ran the course with confidence and attacked the back hills in great stride. She had an amazing kick with 400m to go that led her to out sprint one girl down the homestretch for a 5th place finish in a time of 25:54! The team was rewarded with treats from Coaches for a great kickstart to the season. But the real reward was the smiles, hugs and high-fives after a hard day’s work knowing this year the cross country team will have the numbers to go for a ISAL banner!